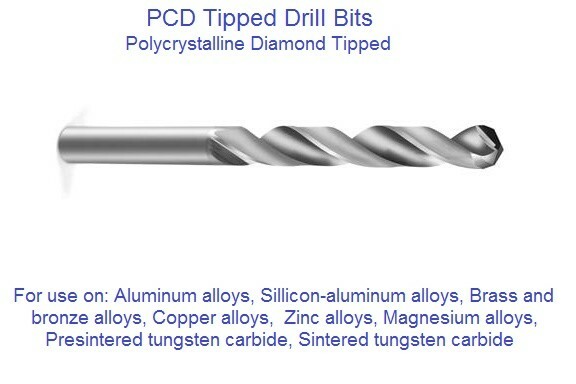 "PCD" tools consist of a layer of Man Made* diamond crystals bonded to each other and to a cemented carbide substance. This combination of tool materials is possible through a sophisticated high temperature / high pressure process. *Random orientation of the diamond crystals means hardness and abrasion resistance are uniformly high in all directions. *Crystal to crystal bonding of the diamond layer significantly reduces the chance of gross fracture under impact. *The tungsten carbide substrate provides strong support for the diamond layer to further increase impact resistance. 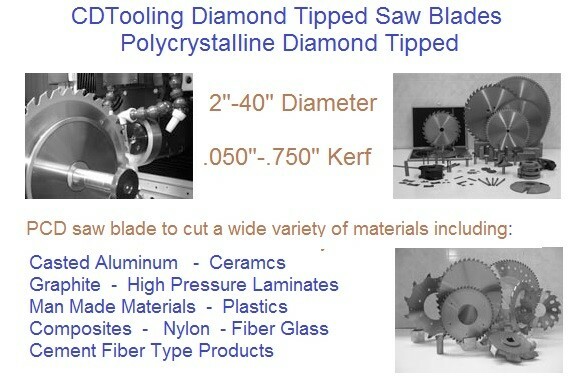 *The diamond layer is flush with the substrate (no overhang) to expedite tool fabrication. *The diamond controlled manufacturing process means physical properties are very consistent from blank to blank. 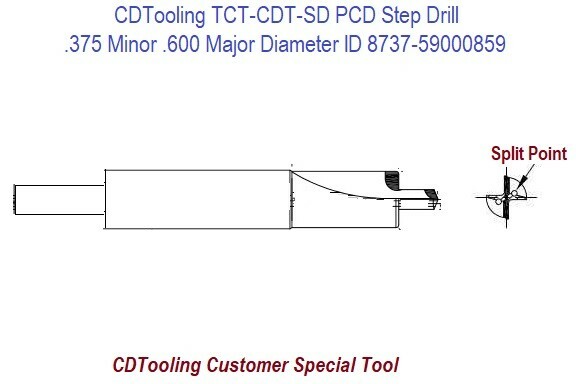 CDTooling PCD Tipped Tools have achieved impressive results machining a wide range of non-ferrous metals and nonmetallic materials:? "PCD" tools have significant performance advantages over cemented tungsten carbide tools. Typical improvements include tool life, better control over part sizes and surface finishes, greatly reduced cost per machine part, and dramatically higher machine productivity. 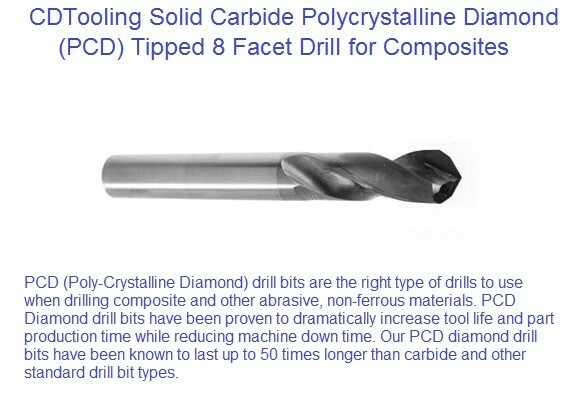 "PCD" tools are also replacing tools made with single crystal natural diamond...particularly where impact is high due to interrupted cuts. Significant performance increases are seen over the life of several tools because the properties of "PCD" tools are much more consistent then natural diamond tools. Also, of course, natural diamond tools are much more susceptible to accidental impact damage. 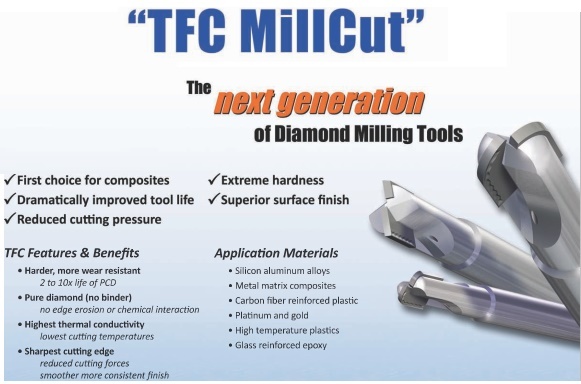 “TFC” Thick Film CVD diamond End Mills extreme consistent hardness that its wear properties are anywhere from 2 to 10x that of PCD with 20% faster Cutting. The extreme sharpness and the pure diamond cutting edge avoids chemical interactions with materials or cutting fluids which eliminates failures. PCD Tipped Inserts with revolutionary 3D chipbreaking technology for the machining of non-ferrous materials. 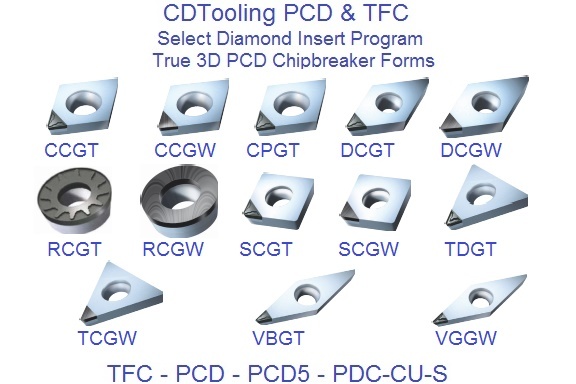 Through the use of advanced proprietary technology, true 3D PCD chipbreaker forms are produced at the cutting point of the PCD segment. The performance results of this dramatic innovation, which is available in roughing and finishing forms, are unsurpassed chip control and dramatically increased tool life. The higher shear angles integrated within the chipbreaker produces lower cutting pressures and less heat expansion of the workpiece. Machining dynamic is precise dimensional accuracy, eliminatng the need for secondary operatons while both increasing productvity and reducing operatng costs. The controlled short chips coming of the workpiece allow for uninterrupted producton runs and practcally eliminates costly maintenance stoppages traditonally required when clearing machines of long uncontrolled swarf. A standard line of PCD turning tools. These tools have a synthetic diamond tip and can provide up to hundreds of times the tool life of standard carbide tools. They can be used at high production speeds on nonferrous and nonmetallic materials such as copper, aluminum, fiberglass, sintered ceramics, plastics, carbide and carbon. 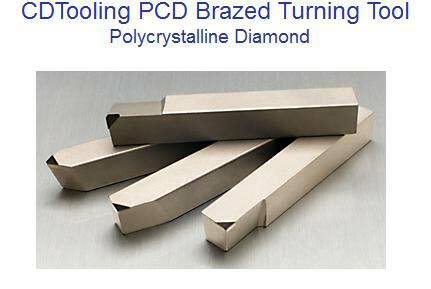 PCD Pollycrystalline Diamond Router Bits provides excellent wear resistance in abrasive materials. * Make sure that the machine has adequate rigidity, and use rigid tool holders and fixtures to minimize chatter and vibration. This will help promote longer life and better surface finishes. 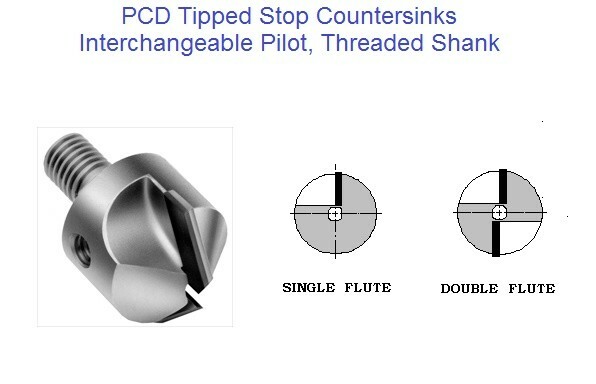 * When "PCD" blank tools replace conventional diamond tools or cemented tungsten carbide, start with the same tool geometries except where other tool geometries have been proven. As experience is gained, it may be possible to refine the "PCD" blank tool's geometry for even better tool performance. 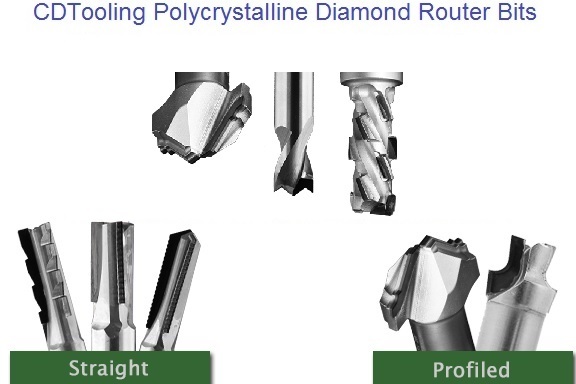 * When replacing conventional diamond tools with "PCD" blank tools, increase the rake angles and use the same machining conditions. Increase depth of cut (D.O.D.) and feed to improve productivity. * When replacing cemented tungsten carbide tools with "PCD" blank tools, increase speeds by at least a factor of three (3) where possible, to increase productivity. Use of a somewhat greater depth of cut will also improve productivity. 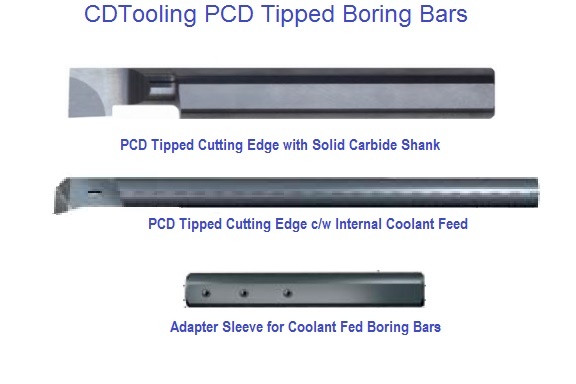 CUTTING FLUIDS * "PCD" blank tools can be used to machine parts either wet or dry. In most cases, however, tool performance is improved by use of a cutting fluid. Soluble oil/water emulsions similar to those used when machining with cemented tungsten carbide tools are widely used, with excellent results. Their lubricating qualities help to reduce frictional heating and the formation of build-up edges while promoting good chip flow. * Whenever possible, machine wet with "PCD" blank tools. Standard soluble oils give excellent results. While satisfactory results can be obtained when machining dry, cutting fluids help to improve tool life and workpiece finishes in many cases. Cutting fluids also help to wash chips away from the tool/workpiece interface and reduce the tendency to develop a build-up edge. * Establish a criterion for tool life and change tools as soon as that point is reached. Do not continue to run "PCD" blank tools after they have lost their sharp edge.